Since I work from home and tend to be by myself a lot, I pretty much constantly have to be listening to something. I don’t like baking or working in silence, and while I usually have music on, I’ve also become majorly obsessed with podcasts. I’m the kind of person who sits in front of the TV with my laptop, doing a million other things, just listening to the TV and therefore missing half of whats going on in the show…so podcasts are pretty much the perfect source of entertainment for me because I can get everything that’s going on without actually having to watch anything. I get to listen to transfixing journalists tell investigative stories, or hear food bloggers be interviewed, or hear inspiring words about bettering myself. They help give a little mental stimulation at a time when I’m usually all in my head. I also listen to hours upon hours of podcasts about food blogging. It’s so inspiring and refreshing to hear the voices behind some iconic bloggers, and both the Chopped Podcast and Food Blogger Pro Podcast have some seriously good interviews that will surely inspire. Being able to hear directly from ad experts, Pinterest experts, and bloggers who get millions of page views is invaluable. There’s something about podcasting that seems like a more personal and intimate form of entertainment than most. You’re letting someone’s voice accompany you throughout your day, keeping you occupied as you drive or work or in my case, bake and edit photos. While making these brownies, I listened to a recent Food Blogger Pro podcast about Pinterest. Learning + being productive + getting delicious brownies out of it? Win-win-win – especially the brownie part. These brownies are chock full of dark chocolate. A dose of peppermint extract and a scoop of Andes mint chips take these brownies into chilly mint territory. After they’re cooled, they’re topped with a rich chocolate ganache and garnished with crushed candy canes. Voila! Easy, beautiful brownies with the best hint of mint. This simple recipe is about to become a favorite – I know it. Enjoy! Preheat oven to 350ºF. Line with parchment and lightly grease an 8x8” baking pan. Put the chocolate and butter in a large glass bowl and microwave for 30 seconds. Stir, and repeat until the chocolate and butter are completely melted and smooth. Add the sugars. Whisk until completely combined. The mixture should be room temperature. Add 2 eggs to the chocolate mixture and whisk until combined. Add the vanilla and peppermint extracts and stir. Do not overbeat the batter at this stage or your brownies will be cakey. Sprinkle the flour mixture over the chocolate mixture. Using a rubber spatula (not a whisk), fold the flour mixture into the chocolate until just a bit of the flour mixture is visible. Fold in the Andes mint chips. Spread the batter in the prepared pan. Bake in preheated oven for about 30 minutes or until a toothpick comes out with moist crumbs attached. Cool brownies completely. Heat the heavy cream for 30 seconds until the microwave until bubbling. Add the dark chocolate and let sit for 1 minute before stirring until smooth. Spread evenly over the cooled brownies and sprinkle with crushed candy canes. Place in the refrigerator for at least 1 hour or until the ganache is set before cutting into 16 equal squares with a very sharp knife. Brownies will keep in an airtight container at room temperature or in the refrigerator for up to 1 week, or in the freezer for up to 3 months. I just started Serial last week and I’m hooked! I can’t wait to hear what happens next! These brownies look amazing, Rachel! I love the rich chocolate and peppermint combo. Just perfect! I think we need to start a new Serial thread in the group so we can discuss recent events. SO good!! I’m glad you started listening :) Thank you so much, Gayle! I cannot believe it’s candy cane season already! I also love podcasts, they make driving so much better too. There’s seriously something to listen to no matter what my mood. You’re brownies look incredible! I have no idea what I would do without podcasts now! I LOVE getting absorbed into the story! And Adnan totally didn’t do it….he just didn’t!! PS. These brownies – loving!!! Pretty sure you need to fedex me a bunch of these. They look incredible! Oh my word these brownies look SO decadent-and I love the peppermint twist! Perfect as a Christmas gift! Oh my gosh!! These look amazing! I’m salivating over here!! What a fun recipe! SO perfect for this time of year!! Oh my word, I love it! These brownies look so so good! 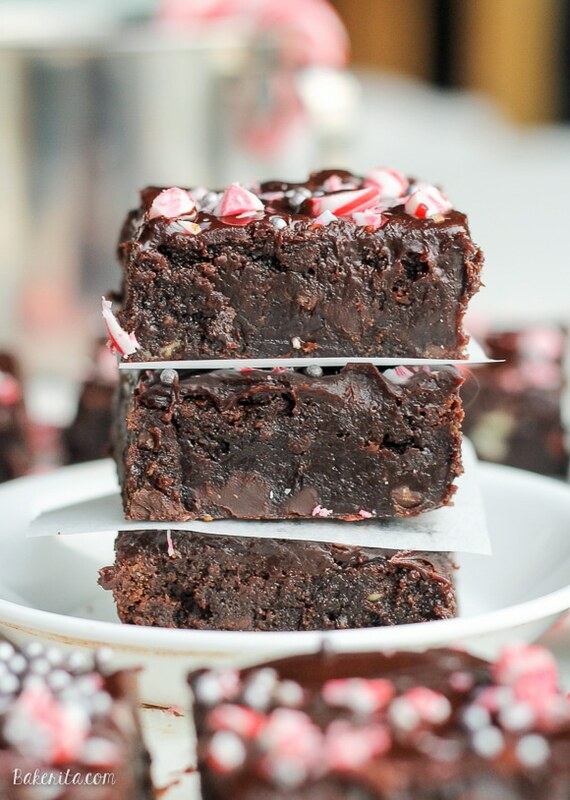 I love chocolate and peppermint together and know they’d be perfect in these brownies! I’ve been getting into podcasts lately too! Especially food blogger pro and chopped! So motivating :) Meanwhile I am in love with these gorgeous peppermint brownies. So perfect for the holidays! I am completely addicted to all the real crime shows on TV so I’m psyched to hear about the Serial podcast series. I already googled it and will be listening to my first episode tomorrow :) Now, on to these brownies…Oh. My. Gawd. They look so moist and chocolaty and absolutely delicious. Love the flavors of mint and chocolate together and I’ll be adding these brownies to my Xmas dessert tray this year! These were very easy to make and tasted great! Thanks a lot for sharing this recipe! So glad that you enjoyed them, Elio! I love podcasts exactly because I can never concentrate on one thing at a time anyways! 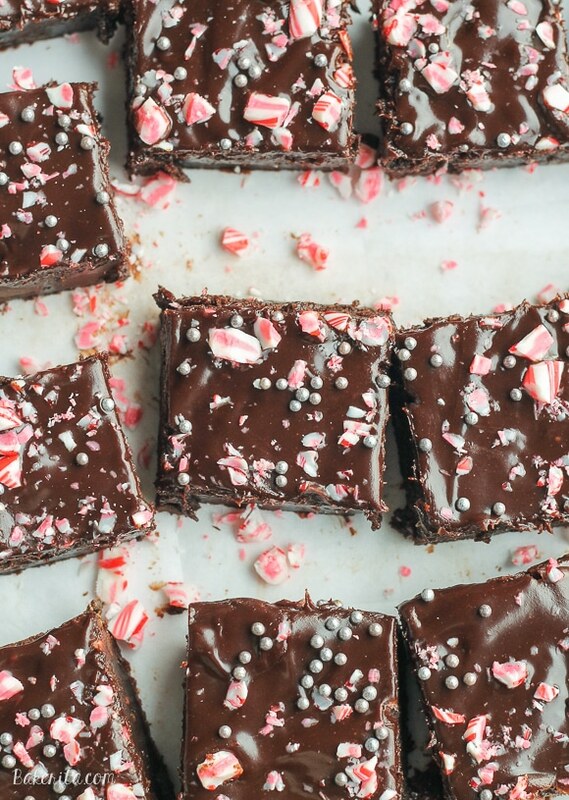 Unless you’re putting a plate of these peppermint brownies in front of me, because eating them would be all I’d think about ;) Gosh they look AMAZING, Rachel! 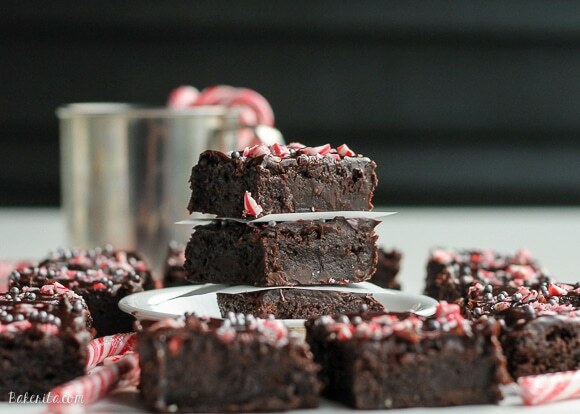 I love to check out peppermint brownie recipes because my son really flips for them. These look crazy fudgy and wonderful!! Pretty sure we are the same person! I always have the TV on but I only comprehend the dialogue because I’m doing ten million other things. Those are two of my favorite podcasts! 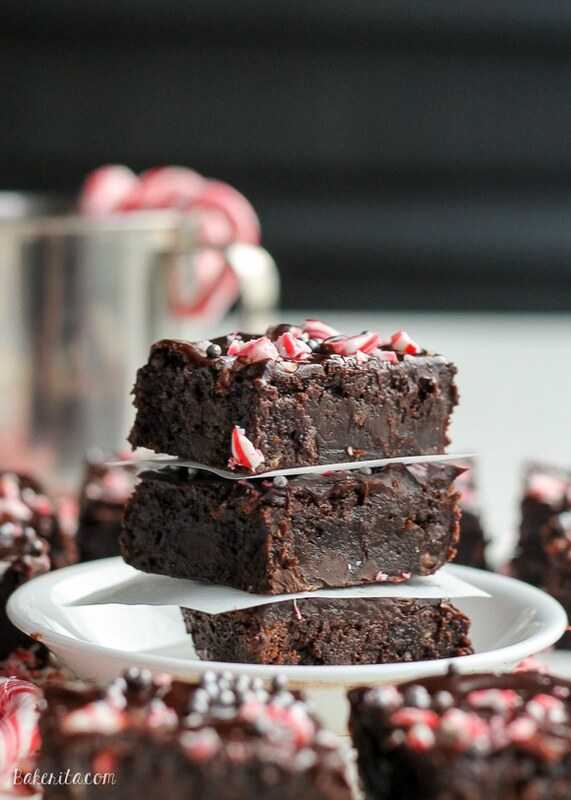 Love that it’s time to peppermint all things… these brownies look like perfection! Chocolate and peppermint is my favorite at Christmas time, and these brownies look like perfection! I’m constantly watching those real life crime TV shows so I’m checking out the Serial podcasts ASAP. Oh my, these brownies are out of control fudgy!!! Your pics are so beautiful and I wish I could reach in and grab one to eat right now :) Def adding these to my Christmas dessert tray this year. Hi Carla! You could definitely make these in the muffin pan, just adjust the baking time to make sure you don’t overcook. I would start checking them at about 16 minutes :) hope you like Serial! What a perfect winter treat! I have never heard of those food podcasts. I’ll have to check them out! These look amazing! Do you know if there are any adjustments I would need to make for high altitude? We are at about 5,600 ft. here. Hi – What kind of dark chocolate do you recommend for the peppermint brownies? I’m making them this weekend. Can I use a different brownie mix and then use your ganache topping? Thanks! Hi Colleen – definitely! You can use this ganache on top of any brownie recipe you’d like. Enjoy. These are do good. Almost like fudge. I tried them today without the peppermint and they were still great! Hi can I replace granulated sugar with caster sugar ? I haven’t used caster sugar too much, but it should be fine!